The list of all fish that you can catch from fishing in Harvest Moon: Light of Hope. 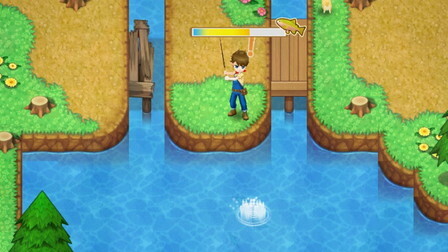 Fishing is one of the activities that you can do in this game. Not only as a side activity, but this entered in the main storyline to find a stone tablet and Dewy (the blue sprite). However, you can not directly fish early in the game. There are several things you should do. First, you must have a fishing rod. It's impossible for us to get fish without a fishing rod, so you must have a fishing rod for fishing. You will be given a fishing rod for free by a villager named Cyril. Before that, you have to fix Cyril's house located behind Naomi's house. You will need Softwood Lumber 15x, Stone 5x, Tulip 3x, and 500 G to fix his house. I suggest you save some Tulip from foraging or plant it in front of your house far away day. Buy the Tulip seeds from Carol. Next day, there is an event about Cyril fainting in front of your house because of hunger. Furthermore, you are required to give him a food. Just give him a Bamboo Shoot or Cabbage. As a thank you for helping him, you will be given a fishing rod by Cyril. 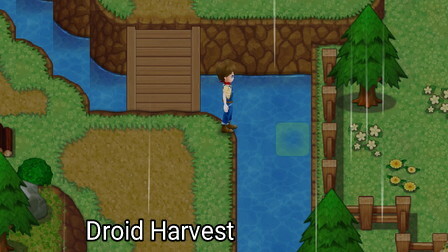 Small pond on your farm. Pond in front of Goddess spring. As a beginning, because you have yet to open a fishing spot on the beach and lighthouse overlook, you can fish in your farm and mountain area. Frequently fishing in the river on your farm to get a Perch which is one of the materials needed to repair Bastian's Restaurant. Before fishing, I also suggest you buy fish bait on Sam. You can also make a better bait if you have a recipe for making it through the Windmill. You will get the recipe if you complete some request from Cyril. For fishing, you must stand near water and throw your bait in the direction that already set. Just click the green box that appears if you stand near water, do not forget to use a fish bait. If there is no shadow of fish in the place you throw the bait, pull back immediately your fishing rod and try to throw it back in the same or different direction. When it appears some shadow of fish, wait a few moments until the bait bitten by one of the fish. After the exclamation mark (!) appears accompanied by the sound of splashing water, pull your fishing rod by clicking the fish or water nearby. Later, a parameter will appear overhead and you have to click or tap quickly, in order to make the parameter moves to the left, and finally, you managed to catch a fish! It will be increasingly difficult to moves the parameter for the bigger fish. Hence, I suggest you use a mouse when playing this game. Note: You can also use the 'X' button to make it easy for you to catch a fish. It's easy after you repair the Doc's architect, place the broken third stone tablet by the lighthouse, and Doc asked for researched it, just fishing on the River near you find the broken stone tablet (see the picture below). If not found there, try fishing in front of Goddess Spring. I've tried two of these spots and both locations contained a third stone tablet fragment. When you fishing there is just one big shadow of fish appears. And when you pulled the fishing rod, it's hard because its parameters are reduced very slightly. When you get this third tablet fragment, Dewy, the crybaby sprite, will appear. Here are all fish (34) that you can catch in this game (see the table below in landscape screen). Note: for the price of each fish, you can check directly on Sam and Bastian. Some price of fish will be more expensive if you sell it to Bastian (a character that has a restaurant).